Rapid Recovery of St. Louis is the Bi-State area’s premier refrigerant recovery company. 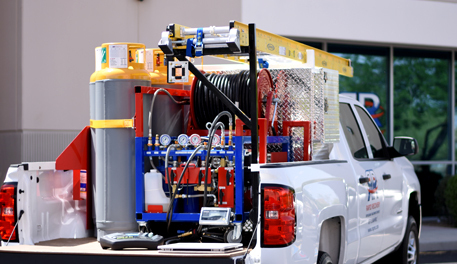 Rapid Recovery has proprietary recovery equipment and infrastructure that can greatly reduce the amount of time spent recovering refrigerant. Whether it’s a large chiller in a downtown St Louis office building or a roof top unit on a Chesterfield strip mall Rapid Recovery can handle the task. We take great pride in our customer service and make it a goal to work efficiently with our customers and their tradesmen on every jobsite. Working in the “show me state” we realize that our equipment and processes have to “show” our customer’s value in every application. Rapid Recovery has locations nationwide that give us deep knowledge of how to move refrigerant fast making our HVAC and mechanical customers faster and more efficient than their competition. All of this is provided by fully trained, EPA certified technicians with all the documentation you need to remain EPA compliant. Let us demonstrate our services for you today. Become part of our growing customer base in Missouri and Illinois. Contact your local St. Louis team today to get a quote on your next project.